Brian Tracy grew up in a poor family and had to wear charity store clothes. After dropping out of school he worked in a succession of laboring jobs, living in boarding houses. At 21 he found work on a Norwegian freighter ship and travelled around the world, but two years later was back laboring and doing some commission selling.Though not an outward success, Tracy had always been interested in the question, "What makes some people successful and others not?" As a freshly minted salesman, he started to read voraciously on selling techniques and what makes the best salespeople the best. He copied what they did, and slowly, his results improved. Six months later he was the top salesperson in his company. When he moved into management, he read everything he could on managing people and built a large sales organization across several countries. Entering the real estate industry, he "hit the books again" and talked to successful developers. His first project was financing, building and leasing out a three-million dollar shopping center. At night Tracy completed a high school diploma, and eventually gained entry to an MBA program to study business theory and marketing, which enabled him to become a management consultant. To learn about happiness, he read what he could find on metaphysics, psychology and motivation, and when he married learned all he could about parenting. To get a sense of perspective, and find out why some countries were rich and others poor, he read widely on history, economics and politics. After two decades of thinking about the question, "What makes some people more successful than others? ", Tracy decided to put everything he knew into a 'success system' which could help others. He designed a seminar, but it took about three years to really catch on. Then he released an audiotape program, The Psychology of Achievement, which went on to sell half a million copies. Maximum Achievement is the written version of this program. Tracy provides us with this potted biography to show how he moved from being a wanderer to a focused person. His varied work roles became his means to continue his real love: studying success itself. As he came to synthesise everything he knew, he realised that there was a 'master skill' which could produce brilliant results across a person's life: the ability to set goals and achieve them. When he discovered goal-setting at 23, for the first time Tracy felt he could have control over his future. Human beings, he learned, are teleological; we are shaped by our ambitions, adapting ourselves to meet the image of an imagined end state. Maxwell Maltz's famous Psycho-cybernetics, told him that man is really a goal-setting machine, needing goals in order to fully live. Maltz compared a person to a self-guided missile, which constantly adjust its path so as to hit a target; in the same way, we could program ourselves to achieve our desires through constant self-feedback. The interesting thing about goals, Tracy found, is that they are value-neutral: whatever desires you set for yourself, you are likely to achieve them whether they are good or bad; therefore, why not take the time to create wonderful, life-enriching goals? Less than 3 per cent of people have written goals, and fewer than 1 per cent regularly review them, Tracy notes. Yet most of us know that it is good to have goals, may even have been to seminars or read books on the matter. We spend a dozen years being schooled, but the most important contributor to success in life - how to concretize our wishes and ambitions - is rarely learned. So why are we not taking the step to set goals for ourselves? Tracy lists reasons, but one that stands out is that we aren't willing to accept full responsibility for our lives. If we don't set goals, then we don't have to reach them. The more mundane reason is that goal-setting has never been part of our family or social background. As a result, we may end up mixing with people who have no clear idea where they are headed, becoming a person who "follows the followers". The payoff of goal-setting is that as we achieve each goal we feel in charge of our own destiny, with every moment taken up productively. Self-esteem increases, and it is easy to remain motivated. You suddenly see the meaning of the saying, "Nothing succeeds like success." Goals must be written down. Although this requires some discipline, there is something magic about 'putting it on paper' which increases the probability of a goal becoming fact. The more detail about the goal, the better, because the subconscious needs details to shape action: "You can't hit a target you can't see", Tracy says. You don't need to worry about the details of how the goal will be achieved, however; what is important is to be certain and exact about what you want. Without this you are leaving your life up to chance. Any achievement, Tracy says, is worthless if it is not congruent with a sense of inner peace, so whatever your goals are they must revolved around a single meaningful purpose for your life. You are only successful to the extent that you can achieve your own happiness, so you must pursue goals that you are vitally interested in - only then can you really be of use to others. Loving relationships should feature highly in your goal-setting. Only when these are going well, he reminds us, "can you turn your thoughts towards the self-expression and self-actualization that enable you to fulfil your potential." Yet very few people have definite goals to improve the quality of their love life. One of Tracy's other key ingredients for success is financial freedom. Money worries are the cause of around 80 per cent of relationship breakdowns, therefore you owe it to yourself and your partner to develop the skills and take the education to make yourself more valuable. 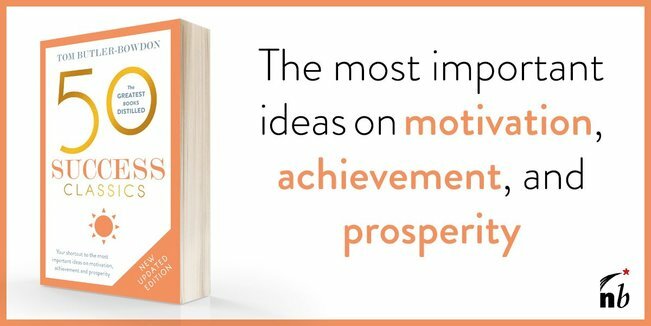 Maximum Achievement is a straightforward success manual, and many of the book's ideas may seem like nothing new - but go beyond the cover and you may find yourself deeply inspired. We have focused here on only the central element of Tracy's philosophy, goal-setting, but there is a wealth of material which answers his original question, "What makes successful people successful?" One of the answers is that they are great readers. The motivational gurus like Denis Waitley, Tom Hopkins, Anthony Robbins and Tracy never seem to miss an opportunity to tell how books opened their eyes to what was possible. This is because the more you read about the lives and actions of successful people, the more likely it is that you will set the bar higher for yourself. "The primary cause of success in life is the ability to set and achieve goals. That's why the people who do not have goals are doomed forever to work for those who do. You either work to achieve your own goals or you work to achieve someone else's goals." Born in Canada in 1944, Tracy is one of world's leading motivational figures and holds frequent seminars for sales forces, executives and individuals. His company, Brian Tracy International, is based in San Diego, California.